The ambulance is not the place runner/rider wants to visit. Heading into the Labor Day weekend and an anticipated participation in The Wright Stuff, a hilly 100, 60 or 30 mile ride in southwestern Wisconsin, it was the climbing that was a primary worry. The hills in SW Wisconsin are humbling to say the least. But as bad luck would have it, it was descending that turned out to be the tarsnake of all tarsnakes. I was really feeling good that Sunday morning. The climbs were actually going great. I hadn’t even gotten out of the saddle on the steepest climb before the first rest stop at Taliesin, the legacy home of Frank Lloyd Wright, for whom the ride is named. Coming off the peak there was a stiff left turn and the road slowly curved north toward the American Player’s Theater, the Shakespeare performance venue where my wife and I had joined friends just 4 weeks before at a production of The Twelfth Night. We’ve been to Spring Green together many times, and I had ridden up and down the hill passing in front of the theater many times. As the descent gained speed, however, the road surface changed ever so slightly. Within 2 seconds of hitting this surface change the bike began to wobble below me. Thinking there were mechanical problems with the front wheel, I touched the brakes to slow down. The estimated speed at that point was around 35-40 mph, cruising speed on hill of that length and grade. The previous day we’d topped 45mph in a noodle ride around Governor Dodge State Park so it wasn’t like we were hitting some new, uncontrollable pace. But the wobble continued to increase in breadth and violence. I tried to quickly yell to my companion who was racing down the hill ahead with another rider we’d joined on the ascent. No one heard me yell, and anyway, things were happening too fast to control. The bike felt like it was going to disintegrate below me, wobbling and shivering as if it were not made of earthly material of any kind. My options were reduced to ugly simplicity. Crash on the road or get to the grassy ditch. Somehow. When my tires hit the grass, an entirely new set of challenges took over, and from that point not everything is clear in in my head. The actual crash happened so fast it felt like time was compressed. Looking back at the evidence once I’d crawled back up to the road, it was clear from the divot where my shoulder hit–pushing a dirt divot a foot high in the air–that I struck ground hard and then slid to a stop down the embankment, 15 feet off the road, tucked into a crease of deep grass. I lay there for a few moments, stunned, just staring up at the beautiful September sky and realizing, “This is not good.” There was no loss of consciousness, just a starkly realized awareness that I’d done the right thing, but things still hurt. So I moved a little, and instantly felt and heard a crunching sound where the left clavicle should be. Yep, busted. It was hard to move much at all, at first. Then I heard the wheels of my other companion whiz by. He’d taken it easier up the last big descent but rolled past faster than I could call out. No other cyclists came by for a couple minutes. We’d started the ride way late because our 4th companion, a woman triathlete from Tulsa, had tires go flat in the first 4 miles. Nearly everyone in the ride was ahead of us before we started. Still more passed by our group as we worked on her flat (s). So given our position toward the end of the ride, I knew my chances were running out to be noticed at all. Heaving up onto my right side, I pushed up the hill and sat there, assuming the pose that every cyclist with a busted collarbone tends to take whether they are local bush league (me) or Europro (in my dreams). Hunched and holding the arm in place, just trying not to move, hoping someone would come by sooner or later. She explained that she’d just attended a seminar with a discussion on the subject. She told me all about bike harmonics and how it is so random that even the experts cannot tell exactly when a bike wobble will happen. While it was a relief to hear her words and understand, in some pain-fogged way, an explanation for my crash, it was also the most terrifying realization of my life. At that moment, I wanted to quit cycling forever if bike wobble could just arrive, randomly, at any moment. That is the very definition of fear and terror if you ask me. Had I known about bike wobble it might have been possible to clamp my knees tightly on the top bar, as Libby advised then––and as I’ve since confirmed on the Internet and hundreds of articles on the topic, and gotten my carbon-fiber Felt 4c (The Red Rocket, it was called in a 2006 cycling magazine Bike of the Year review) under control. Again, I’m no pro rider. I compete in CAT 5 and Master’s 50+ races. My training rides solo average from 17-19 mph, and group rides to 20mph average. My top crit average was 26.8 mph in a 40 minute+2 laps criterium. But nothing in any of that experience prepared me to handle bike wobble at 35mph on a hill in Wisconsin. When the paramedics arrived it was all the standard procedure. But they were rookies it seemed, who did not even know whether to put my neck in a brace. My blood pressure checked out and I wasn’t going into shock. The riders who stopped (God Bless the Good Samaritans) to help the bloodied, beaten rider out of the ditch said goodbye and good luck. Then they closed the ambulance door and I realized, this is the first time I’ve ridden in an ambulance for my own injuries. The little Upland Hills hospital in Dodgeville confirmed the worst news with an x-ray. There wasn’t much they could really do but give me a sling and send me on my way to go to a doctor back home. But I did not see the actual picture x-ray image until visiting the Emergency room at Central DuPage Hospital, where my friend the triathlete is a lead doctor. 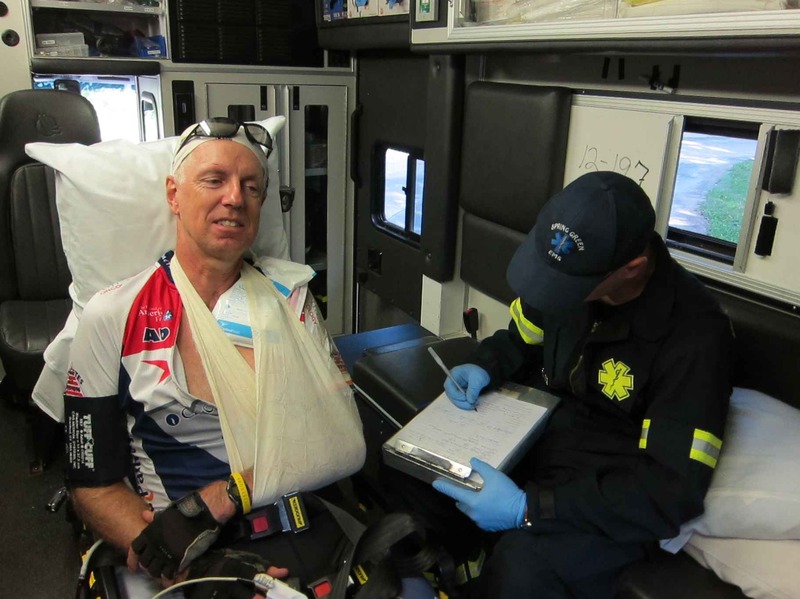 It was not a pretty sight, that fractured collarbone. Surgery is pending. My companions had worried and wondered where I’d gone, of course. But having trained for more than 40 years since high school with the two of them, they figured I might have either gotten lost (though I told them I knew the roads well) or done some other Cudlike thing. I’m not always the most predictable character in good times or bad. Or so they intimated. They inquired to the race officials and communications had not gotten through from the EMTs to the meat wagons driving the course in search of crashed up people like me. 100 miles of road is hard to cover even on a bright September day. I’m grate I did not cover any of that road with my skin or limbs, frankly. Grateful to have reached the weeds and missed the hidden wire cable by inches, apparently. Grateful there is no brain or spinal injury. Hardly any road rash even. Grateful that I am alive and able to write these words 2 days after a terrifying tarsnake of 75 yards of bike wobble at 35mph. Just grateful. It will be a little while before I ride again. But I’ll keep writing. Riding and running and writing are one and the same to me. I’ll start by walking. Then running. Then get back on the bike when healed. It’s what I’ve always done through injury and circumstance. This entry was posted in Tarsnakes, We Run and Ride Every Day and tagged bicycle harmonics, bike crash, bike wobble, crashes, cycling, cycling accidents, harmonics, riding, The Wright Stuff. Bookmark the permalink. I had a similar experience, steep downhill 51 mph high speed wobble hits. Long story short, I survived unscathed, more luck than skill. I did some research on the phenomenon and found a solution, resting one knee on the top tube or clamping it with both dampens the vibration. Problem solved, it never happened again.